Know Whey: Why not Camembert? 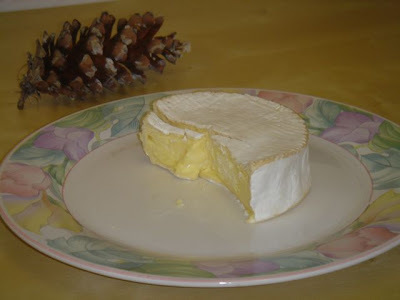 Camembert is a relatively easy and quick cheese to create. So why not make some? Camembert is a surface-ripened cheese, so the white mold has been placed there intentionally, to develop the creamy texture of the cheese, as well as contribute to that classic flavor. Once again, proper salting is essential to control the development of acidity. Thank you for posting your beautiful blog! I used to work in a goat cheeserie and now am relearning how to make cheese in my kitchen with limited resources. I'm really fascinated with your style and am wondering if you have a little time to answer questions. I can pass the information onto a handful of fellow cheesemakers here in Southern Illinois. Right now, I'm in day 3 of my very first homestead brie, and if I don't get the humidity up a little higher, I may not be successful at all. I am planning on doing exactly what you have shown in the picture with the plastic tubs, but don't have anything that will fit under my aging mats to keep circulation under the cheeses. What do you have under there, and what kind of lid did you use? I would love to see pictures and/or pick you brain a little bit. I'm fascinated with your cheesemaking - thanks for taking the time to create this wonderful blog! I'm currently trying to relearn how to make cheese at home with limited resources. If you have a little time, I would love to ask you some questions. I have fellow cheesemakers here in Southern Illinois to pass the info to as well. 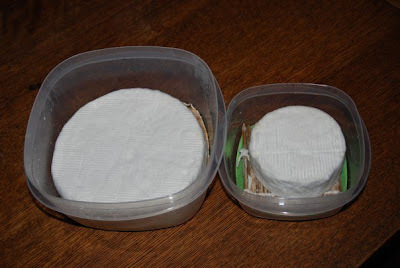 I am about to implement your method with the plastic tubs for aging my very first batch of homestead brie, but am wondering what you have under your aging mat and what type of lid you have to cover the cheeses. I'm day 3 into aging the brie, and the mold development is slow due to lack of humidity (in a mini fridge at 52 degrees). I know exactly what they should look like during the process as I worked in a certified cheeserie, but who can afford one of those anyways?! So, I would love to make some cheese that looks even half as decent as yours and hope I can pick your brain sometime soon...my brie depends on it!